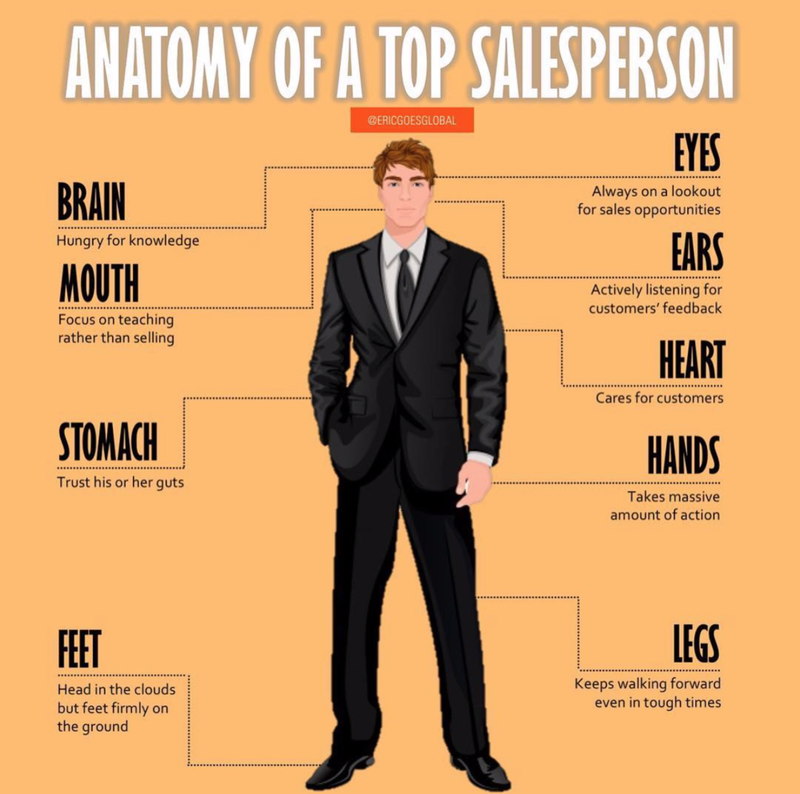 Anatomy of a top salesperson - what separates the best from the rest? The most successful people in any field are always life-long learners. They always have a book in their hand or a podcast in their ears. Are you consistently reading books or taking training courses on sales, marketing, business etc? Are you learning more about your products, about your target market and about your industry? Take a look at your content: branding, marketing, sales collateral, social media content…is it focused on teaching? Or is it focused on your product? Notice the difference? The top sales people are focusing more on teaching than selling. Your customer can probably buy your product at a similar price and similar level of service somewhere else. But very few companies are TEACHING. You can always tell who will be successful by how deeply they care for their customers. They fight for them. AND, they truly care about their customer’s success, so you will see more consultative selling vs hard selling. What’s the biggest difference? They are teachers! The best of the best are extremely competitive and hate losing. But, they don’t take losses personally. They take full responsibility of each loss, and then breakdown what happened to LEARN what they could have done better. How should they have prepared differently? What should they have said differently? Was the lead qualified correctly? What do you think separates the best from the rest? Comment below! 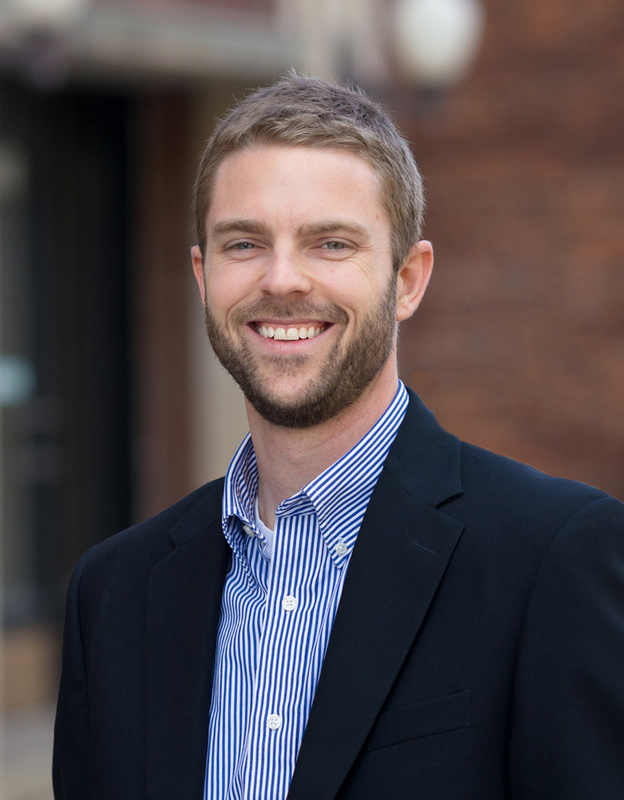 Brad joined the cfm team in 2006, and now as the Vice President of Commercial Sales, he focuses on business development, as well as helping contractors and engineers find creative and unique solutions to any size HVAC project. When he’s not at work, Brad enjoys reading, running and spending time with his family. “Who moved my cheese”, by Spencer Johnson is a short fable about dealing with change in both work and in life. In this quick read, a couple of mice (Scurry and Sniff) and two littlepeople (Hem and Haw) find months worth of cheese in the maze they are living in. Soon after they eat all of the cheese, Scurry and Sniff quickly run off to find more. But Hem and Haw, who didn’t even notice that the cheese was slowly disappearing, stick around to see if the cheese will magically reappear. Once Haw realizes that no more cheese is coming back, he decides to go searching for more. Hem decides to wait it out. He thinks that this sudden change is not fair. He feels that he is entitled to the cheese that he originally found. Throughout Haw’s journey to find more cheese, he learns quite a few lessons about change. He writes each lesson on the maze walls, hoping that Hem will try to come find him and will see the notes. One thing that is certain in life and in business is change. In business, your customers will change how they buy. Your customers will change how they communicate. Your customers will completely change what they need. In life, your bills are going to get more expensive. Your favorite restaurant is going to close. Your children are going to move out of the house (this might be a good thing depending on your scenario!). Just remember that change is coming your way, so get used to it. Be on the lookout for change. Always be searching for new ways to adapt to the changes. If you stay ahead of the curve, you can help steer the change to work to your advantage. In the end, just remember to enjoy change. Savor the adventure and enjoy the taste of new cheese! Much of Godin’s book “All Marketers are Liars Tell Stories” has a strong focus on a B2C model. However, even in the B2B model, your customers are STILL consumers. They consume your message, they consume your services, they consume the experience of buying (or not buying) your product or service. Before we get to Godin’s marketing process, we need to cover two definitions: Worldview and Frames. Worldview refers to the rules, values, beliefs and biases that a consumer brings to a situation. If Jason had a terrible experience the last time he bought a car from a used-car salesman, his worldview when he visits a dealership four years later is different than that of someone who is buying her third car in four years from the same place. Frames are elements of a story painted to leverage the worldview a consumer already has. Krispy Kreme did it with the phrase Hot Donuts. Hot means fresh and sensual and decadent. Pile that onto the way some of us feel about donuts and they had tapped into an existing worldview (donuts = sensual = hot = love). It wouldn’t work on everyone, but until people changed their worldview (donuts = carbs = get fat), they did great. A consumer’s worldview affects the way he notices things and understands them. If a story is framed in terms of that worldview, he’s more likely to believe it. Consumers notice something only when it changes. A first impression causes the consumer to make a very quick, permanent judgment about what he was just exposed to. So be very careful to make sure your first impression is a great one. The marketer tells a story about what the consumer notices. The story changes the way the consumer experiences the product or service and he tells himself a lie. Consumers make a prediction about what will happen next. Consumers rationalize anything that doesn’t match that prediction. Marketing is now so well developed and so embedded in our culture that consumers no longer make decisions based on a rational analysis of facts. Instead they decide based on the stories they’re told. The authenticity of the story determines whether it will survive scrutiny long enough for the consumer to tell the story to other people. Sometimes marketing is so powerful it can actually change the worldview of someone who experiences it, but no marketing succeeds if it can’t find an audience that already wants to believe the story being told. Consumers are all different, but ultimately they all want the same outcome. They want to be promoted, to be popular, to be healthy, wealthy and wise. They want to be pleasantly surprised and honestly flattered. So before you blame your marketing strategy, take a HARD look at YOUR product or service. Is it SO good that it’s worth sharing? -Creating a list of prospects to call on (when you already have a long list). -Making a list of new products or services to sell. -Adding contacts to call on someday, but not right now because you're too busy. -Jotting notes down about a new sales strategy. -Making notes about a marketing blog to write. -Scribbling notes about future customer events to plan. These lists can be exhausting. Here is an email I sent to my team last Monday at 6:38AM that, I hope, helped relieve some idea fatigue. Hopefully it helps you too. PS: I think I needed it more than anyone else. It’s time for spring cleaning in the fall. Do you have anything on your “to do list” that is 45+ days old? Delete it. Get it out of site. Move it to “old mail”. Move it to “done” in Evernote. If you truly think it can’t be deleted, then delegate it or put it on your calendar as a time block this week to get it done. We all have so many things on our to do list that never get done, and it clogs up space in our heads. Each “to-do” task wastes a microsecond every time you read it, and then you feel bad that you haven’t done anything. Then you don’t take action because you don’t know where to start. If you’re extra brave, move the expiration date to 30 days out. I GIVE YOU PERMISSION. TIME FOR A CLEAN SLATE! It’s easy to spend all your time worrying about your product's features or your company's competitive advantages. But if YOU aren’t sold on yourself, then neither will your customer. You have to BELIEVE in yourself. You have to know that you are great; that you can figure out anything that you put your mind to. So focus on yourself first. Are you confident in yourself? Are you confident that you are great at sales? If not, work on your mindset before you worry about anything else. So start asking questions. Lots of them. Once you think you’ve asked enough questions, ask some more. You will know when you’ve asked enough questions because your customer will eventually get tired of talking about themselves and their company, and they will eventually start asking questions about you. And now that you know all about their company and their issues, you can steer the conversation to the solutions you have for their biggest challenges. This is easier said than done. But you have to make sure you’re talking to the right person or group of people in the company you are selling to. In his book “How to Sell to Anyone”, Stu Heinecke talks about finding the CEO of the decision maker for the product you are selling. Everyone thinks that they need to be talking to the CEO of the company, which in some cases is the right move, but if you’re selling coffee and styrofoam cups to a $5 billion company, you don’t need to be talking to the C suite. Calling one step higher than you think is a great idea, because then you can get a referral down. Just don’t go too high or you will waste everyone’s time. If you don’t understand what motivates your customer, you probably won’t be getting any purchase orders. Hopefully you did a good job in step #2 and asked your customer lots of questions to get an answer to this question. It can be really easy as a sales team to over-complicate things. For example, you might feel the need to have a sales process that is too detailed, IE: A) go on as many sales calls as possible, B) Try to close 5 new customer for each of our 3 categories every quarter C) during each sales call focus on 3 things that we are good at and find out D) 2 problems they are having E) follow up the next day and then F) follow up again 4 days later, then G) use the 6 step follow up process until you get direction from your customer- and H) …. I)….. If you can simplify your sales process and your process of how you take care of your customers, you will win. 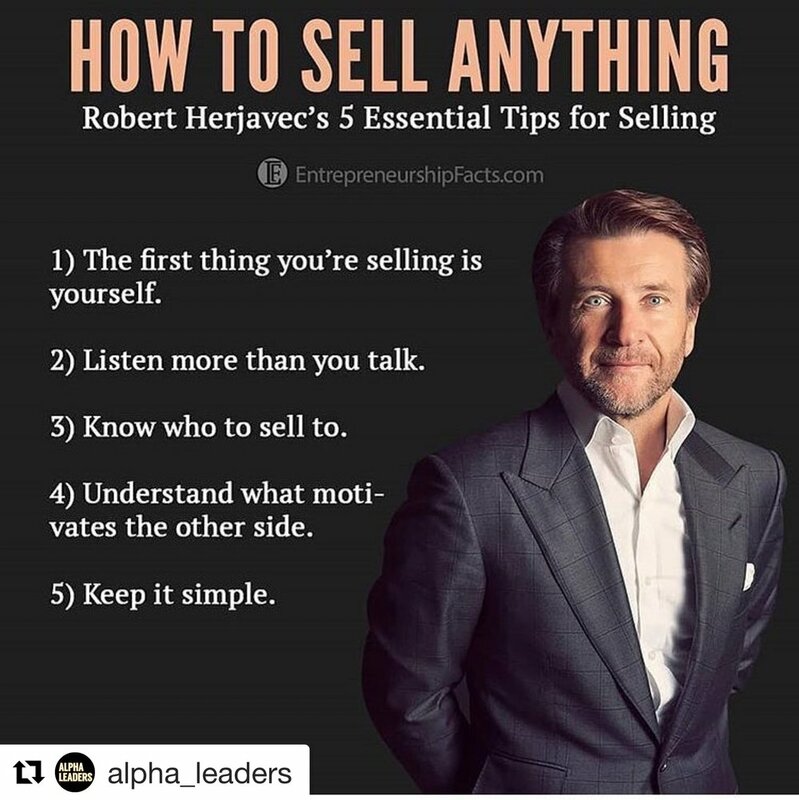 What’s your favorite tip from Robert? Which one will you implement today?